At the Radiology Business Management Association (RBMA) meeting this past spring, Thomas Greeson, a health care attorney with the firm Reed Smith, outlined the typical advantages of hospital-owned radiology practices. Of course, any perception of advantage probably depends on whether you’re the hospital or the radiologist. Greeson said that, from the hospital’s perspective, the typical advantages of radiology practice ownership include control over the delivery of care, the elimination of potential competitors, and greater leverage in payer negotiations. For radiologists, Greeson says the typical advantages to being an employee of the hospital include improved quality of life when freed from the responsibility of managing the group, reduced administrative costs, leverage in payer negotiations, and the practice’s interests tend to be well aligned with the hospital’s. Successfully aligning the practice’s interests with the hospital’s interests strikes me as the most important step toward a stable practice in the coming years. And despite the talk that many younger radiologists might prefer to be employees, I think achieving such alignment while retaining an independent practice remains a preferable option to most radiologists. A radiology group’s leaders would do well to focus on identifying the hospital’s needs and interests and how the group can serve them. While that seems obvious, I’m not sure that’s the case. One RBMA speaker asked whether the attendees’ groups understood their hospitals’ key operational and marketing challenges—by a show of hands, most didn’t. 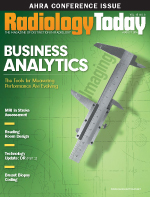 As one consultant put it, hospitals want radiology services that give patients and referrers quality reads and service with minimal problems—and don’t compete with the hospital for imaging business. It’s simply in the best interest of the radiology group to focus on the hospital’s objectives as well as the group’s. Health care is consolidating and integrating all around us. Reform is narrowing networks, strengthening the hospital’s role as the primary customer. Many groups serve their hospitals well, perhaps without consciously studying and focusing on the hospital’s needs. In a teleradiology-enabled imaging environment with more potential competitors, that conscious focus needs to become a priority. While the hospital financial types might like the idea of capturing some of a radiology practice’s profits for the hospital, they’re more likely to resist that siren song if their radiology group is meeting the hospital’s needs and providing quality services with minimal problems. If you plan to attend AHRA in Washington this month, stop by booth number 636 and say hello. We enjoy meeting our readers.